Anxious to continue moving, Brian peeked his head out of the hatch before our alarm even sounded. 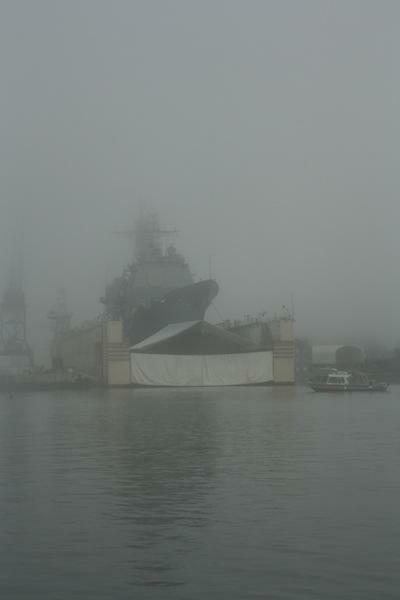 He returned to the v-berth with a weather update, “back to sleep,” he said, “we’re fogged in.” Fog!? In Florida!? 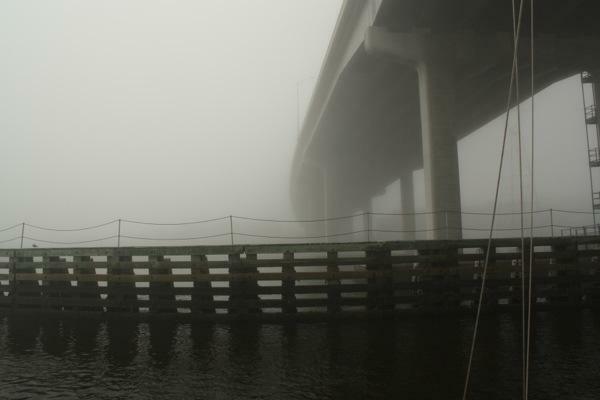 I had to see for myself and sure enough the fog was so thick that I could not see the Sisters Creek bridge about 1/4 mile away. So we slept, and had breakfast, and waited. 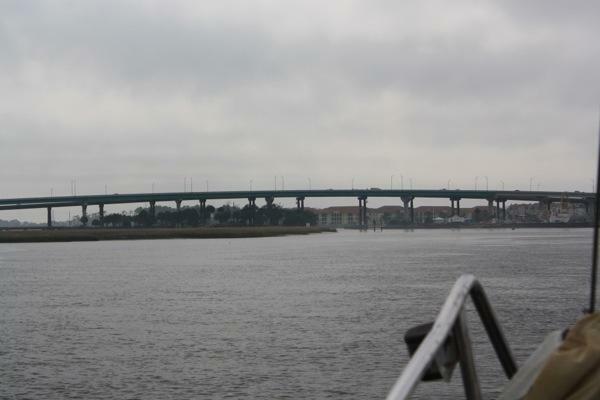 At 10:30am the fog hasn’t lifted but we had to get moving to make St Augustine by sunset. 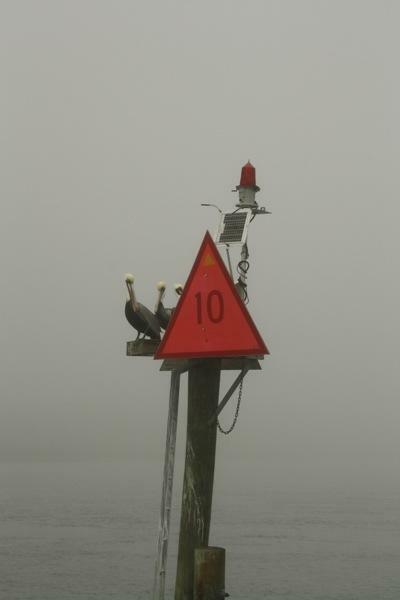 We hauled anchor, lit the running lights, switched on the radar, and were off…very slowly. The bridge tender lifted the Sisters Creek bridge at our request. We waved as we motored through. 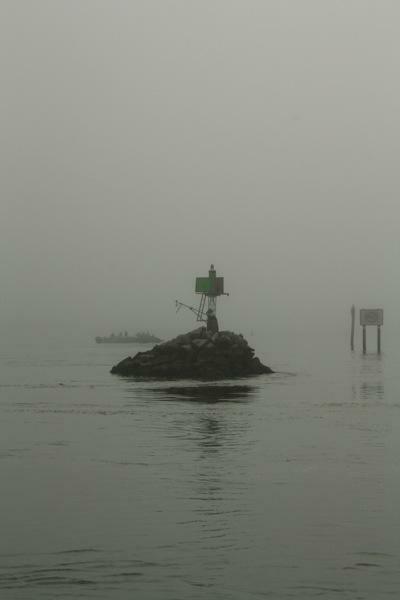 Intersection of Sisters Creek, St John River, and Intracoastal Waterway; here you can barely see the shipyard and our next navigational buoy. 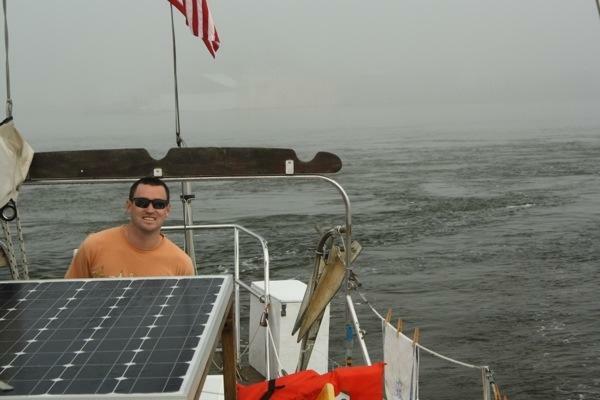 Brian masterfully steering through strong currents; we weren’t expecting currents either in Florida. 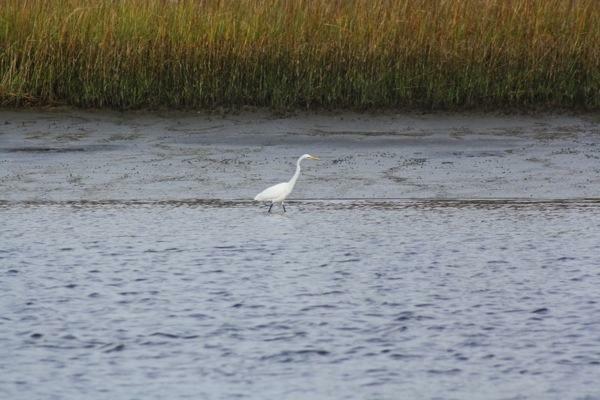 Our New England experience was paying off today! Pelicans lazily peek to see who’s passing by. 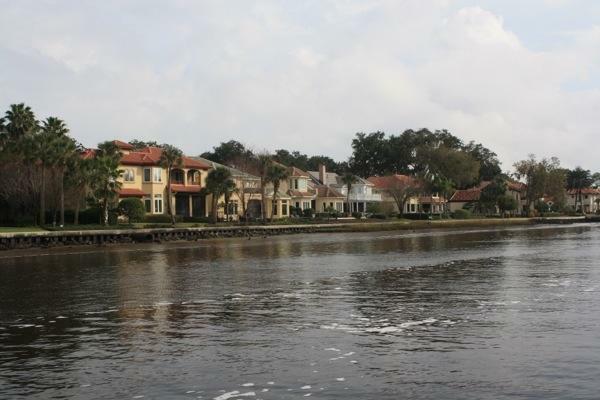 We had a lovely showing of prime real estate along the Intracoastal Waterway. The neighbors were out for a stroll. 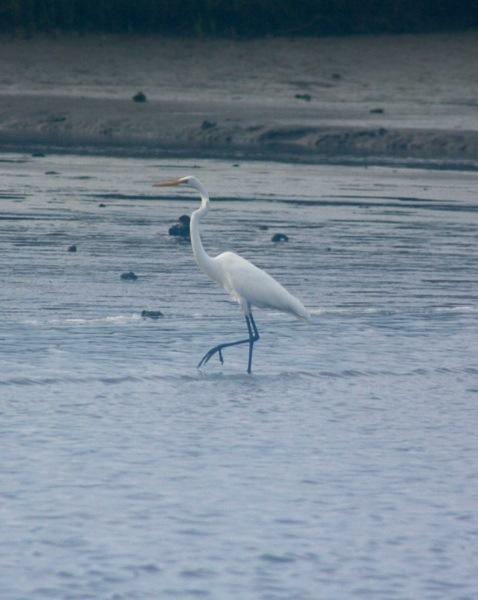 We need some help from our bird watchers, have’t yet identified these birds. They do like to crowd small spaces. 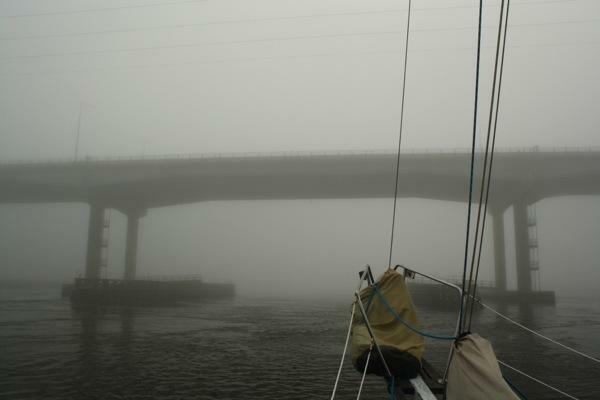 The fog and opposing current had slowed us down all day, but we were able to make it past the St Augustine inlet just as the sun was setting. The Municipal Marina guided us to our mooring ball. 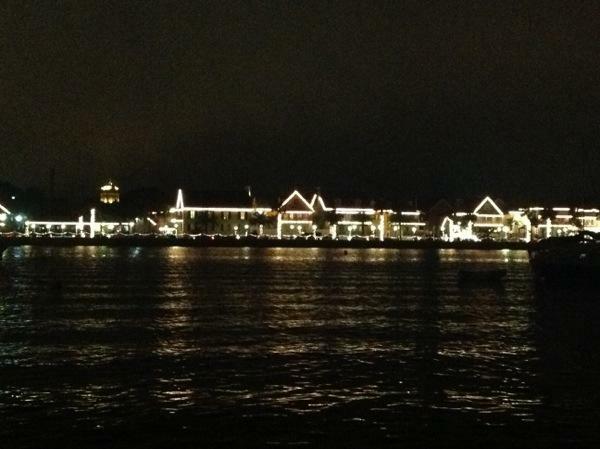 We were welcomed to St Augustine by the brilliantly shining Christmas lights (which remain lit through January). What a sight! 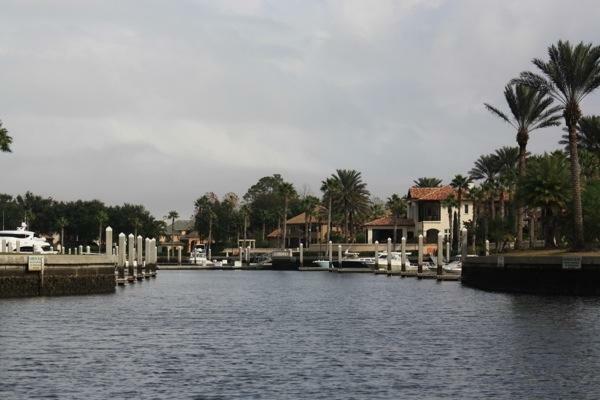 As soon as Rode Trip was settled, we headed ashore to check in with the marina and use the facilities to freshen up. Then out on the town, we were reunited with old friends and enjoying new friends too! Good times were had with Matt, Jessica, Frank, and Yu. 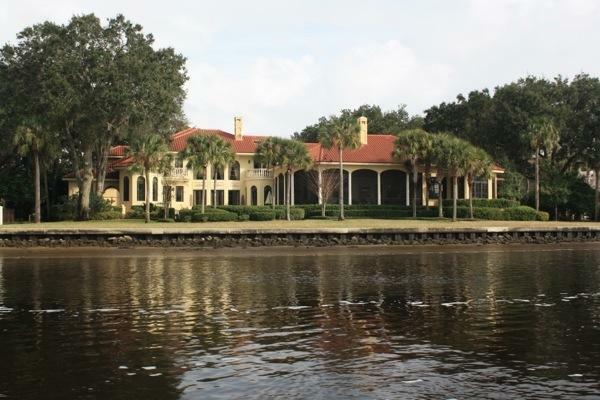 This entry was posted in Uncategorized and tagged 20130109, Intracoastal waterway, sisters creek, St Augustine by stephanie. Bookmark the permalink. 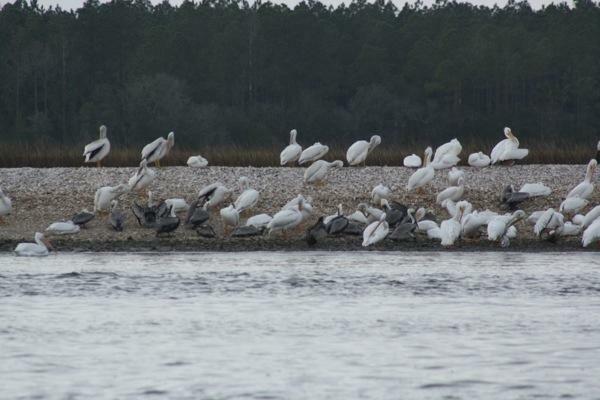 That’s a Great Egret there, and in the group photo, those are American White Pelicans. 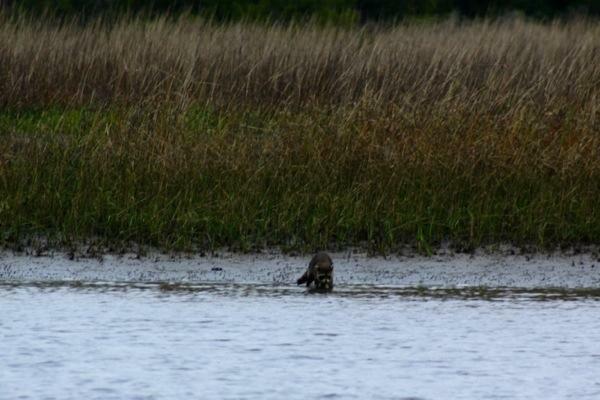 I can’t see the darker birds all that well, but maybe they are Brown Pelicans?